Kat announced on the show's @Paraviewradio Twitter account that she admins, she's created the new Hashtage #paraviewlive for listeners and such to use. I learned, after the show had begun, that we had a returning guest with us as well: Cat Gasch, so I had zero time to pull up any bio info oon her from any of her three previous appearances for the start of the show. Mike and Cat knew each other, and occasionally investigated with each other. At the mention of Antietam, Henry and Kat pointed out some experiences they had had when they broadcast the show live from there. Mike spoke about the Guthrie, Oklahoma Stone Lion Inn, a B&B which is very active. He also spoke about the Skirvin Hotel known for the NY Knicks blaming hauntings at the hotel for a game loss they suffered. Mike spoke about an EVP he got at the Black Bear Church and Cemetery regarding affirming something Mike had said, but another saying, "My teeth are warm." He clarified a Black Bear Church and Cemetery documentary as/in Ghosts and Legends Episode 4. After the break we discussed the Church of Darkness. Kat and Mike spoke about investigations he'd had with his Society of the Haunted group, as well as a self illuminated orb photo on the site that Mike had taken. Ceiling Cat Barbara Duncan reported tonight our having listeners in the US, the UK, Canaeda, German, Australia, Ireland, Unknown, and Japan. Mike discussed his Campfire Tales: Midwest book, his The Inscription of Evil Times book, and Tenkiller Lake which allegedly houses a octopod cryptid. He spoke about Stull, Kansas, known as a Portal to Hell. Referencing his Ghosts of Maryland, Mike spoke about Montpelier mansion in Laurel, Maryland. Mike gave out his MikeRicksecker.com, and HauntedRoadMedia.com websites; as well as their YouTube channel. Mike is also on Twitter @MikeRicksecker, and Facebook. The following Saturday being Boxing Day, Henry announced that as the next week was the day after Christmas, we would replaying the Ohio Haunted Home edition of the show from December 2014. Kat was absent, so I gave out the show's @Paraviewradio on Twitter, Kat's Jinxed Comic site, which also has a @jinxedcomic Twitter page, along with her @KatKlockow Twitter account, and Kat's own official website. We can be contacted by email, the official show page is at Paranormal View, and previous shows are available on iTunes. and we wrapped out. 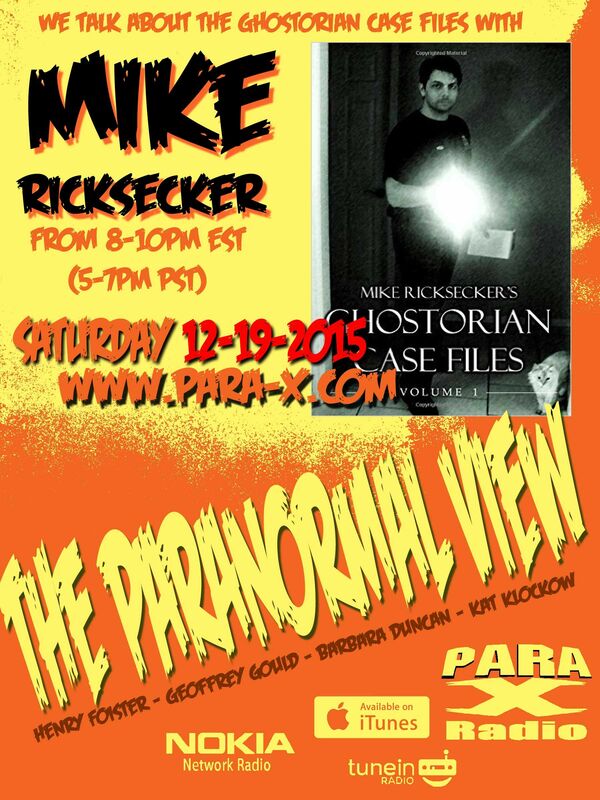 19 December 2015 The Paranormal View.